“AdelFox – Multi-Purpose PSD Template” is a great design idea for website of Creative Corporate, Corporation, Organization, Community, Company Profile, Personal Portfolio, News, Creative Blog, Gallery Photo and more… “AdelFox” is a creative modern and multi-purpose PSD Template. Template designed for convert into WordPress, Joomla and other systems. In line with modern design trends, color fresh and dynamic. Creative Layout and Smart. Super Clear and Clean Layout! This is a great choice! 150 PSD files included – The design is very elegant and modern, and also very easy to customize. 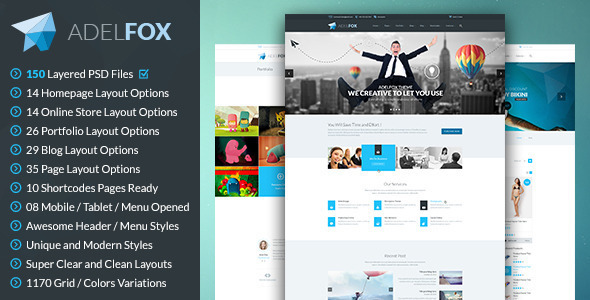 TheFox is AdelFox’s Next-Generation – The #2 Selling PSD Template of All Time on Themeforest. You will love TheFox!!! Go to Download and Enjoy now!!! New Feature: Up to 150 Perfect PSD Files. New Feature: Banner Smart Object Ready in Homepages. New Changes: Blog / Portfolio / Contact Elements. What buyers say about AdelFox? 150 Perfect Pixel / Layered PSD files. The #3 Selling PSD Template Of All Time On Themeforest. Themeforest Most Popular PSD Template. Based on 978px Grid System. 14 Homepage Layout Options: 11 Verions. 14 Online Store Layouts: 8 Online Store Index Options, 3 Online Store Detail Options, 3 Cart / Checkout / Checkout Order Received. 26 Porfolio Layout Options: 4 Portfolio Versions (19 Layout Options), 7 Portfolio Detail Options. 29 Blog Layout Options: 5 Blog Versions (26 Layout Options), 3 Blog Detail Options. 35 Page Layout Options: 5 About Us Options, 2 Our Team Options, 3 Services, 4 Contact Options, 3 Loading, 4 Login, 1 Signup, 4 Coming Soon, 2 Error, 4 Search Results, 2 Forgot Usename / Password, 1 Sitemap. 10 Full Shortcodes Ready: 1 Pricing Tables, 2 General, 1 Typography, 1 Introducing Box Style, 1 Skill/Progress, 1 Blog Widget, 1 Forms Style, 1 Lightbox Style, 1 Subscribe Style. 7 PSDs Full Header/Navigation Style: Light / Dark / Dropdown Menu Style / Search Box / Language. 1170 Grid System Update: 2 Index Light / Dark. 08 PSDs Mobile / Tablet Ready: Light / Dark: Menu Opened. This PSD theme is perfect for convert into website project of Creative Corporate, Corporation, Organization, Community, Company Profile, Personal Portfolio, News, Creative Blog, Gallery Photo, WordPress, Joomla and other systems. Images links will be provided after you purchase this template. A Product of Tran Mau Tri Tam – Depla Mag and Uoneo.